Anyways, thank you and thank the others again and again and again sooooooooooooooooooo much for what you do for us too. Thanks for such wonderful cards - every day (that's correct - every day) I write one of your cards to my wife, son (8), and daughter (5). When they arrive from school they go straight to the mailbox to pick up mail and read my daily letter! Thanks again for everything you do. 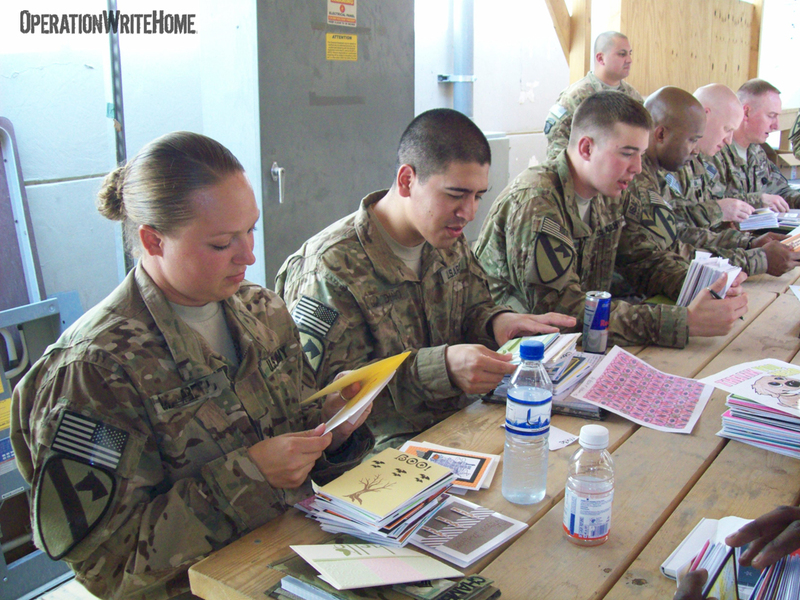 It does make a big difference for those of us who are far from home - and the loved ones who find the cards in their mailboxes. Jason got his cards and even sent me one...what a great guy! Sorry I didn't get a chance to send this email earlier, I have been in the middle of moving to another base as our current office is closing in a few days. I want to let you know that the cards meant a lot to us here, you wouldn't believe the rush to the box when I tell everyone the cards have arrived. The office has since been split up but I just want to say on behalf of all of us, thank you and your staff for giving us a piece of home. THANK YOU. Received a box of cards today with the Halloween one's - they are my favorite! Thanks so much! However, I'm sad to say that I am redeploying back stateside next month and need to be taken off the mailing list. I have very much enjoyed the cards and everyone here at HQ ISAF I share with has loved them as well.Thank you for helping us stay in touch with loved ones back home. *My reply: "Don't you dare say you're sad - our cards are great, but home is better!" A note of thanks to let you know your lovely cards were shared with the Pat Tillman Memorial USO at Bagram Air Field, Afghanistan and is being enjoyed by the service members traveling through our center. 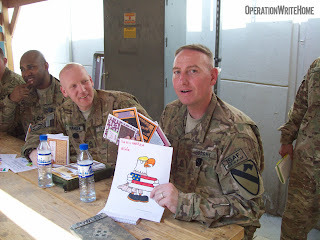 Your generosity has helped raise the spirits of our soldiers and we appreciate it very much! Every day soldiers look through your cards to send messages home to their loved ones, you efforts are making a significant difference. We look forward to receiving additional cards from you. I arrived to work this morning to find a large box of beautifully crafted cards in the foyer for all to enjoy. I had a hard to resisting them all and selected a few to send to my family and my wonderful Fiance. We are on a relatively small post where the PX fits in a trailer, no cards there. Thank you for what you do, we so very, very much appreciate such a thoughtful gesture. These photos were taken Saturday when I handed out all the cards from our first box. We all appreciate the time and effort put into this project, Thanks! Operation Write Home. My mom is going to love it! 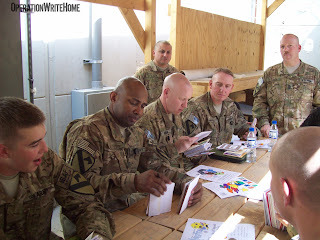 Thanks for your devotion and incredible zeal for our Soldiers as we are deployed! I Corps from Joint Base Lewis McChord (Fort Lewis) has been in country for 2 months. We are located in Kabul, Afghanistan. I have seen a few of the wonderful cards that you send to us. I would love to see boxfuls of them for our troops and myself. It is my personal goal to write my wife and kids every day... I want my 5 year old daughter and 1 year old son to know how much I love them and miss them. E-mail just does not complete the process of communicating this... I want my kids to hold a card 20 - 30 years from now with my own handwriting and thoughts towards them. I make sure I trace my hand on every letter I send. This is how I connect with my family... not through skype or any or technology. My daughter will talk maybe 10 seconds on the phone... but she, along with my son, will hold these hand-written cards for life. What a wonderful legacy! I've been on three deployments now and I'm finishing (hopefully) the last few months now. 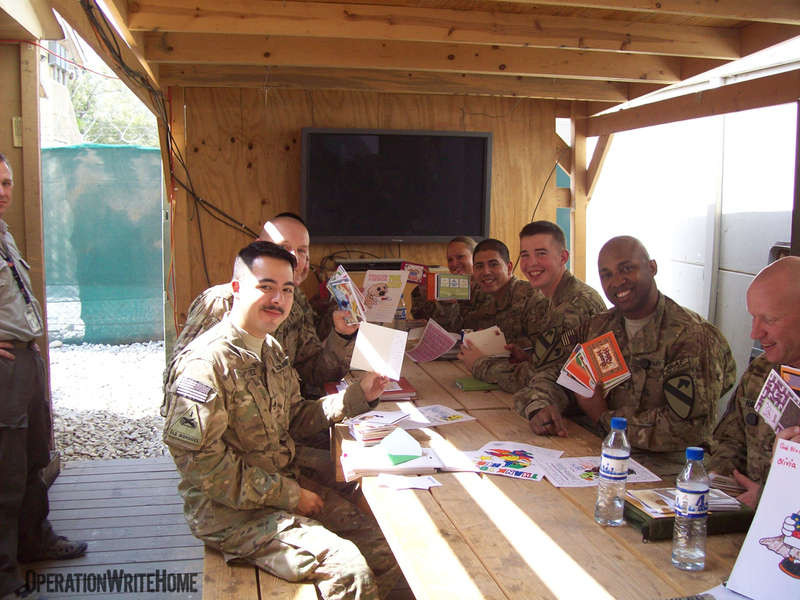 I have to say thank you SO much for the incredible cards your organization provides troops. We have email, skype, and phone services, but there is something irreplaceable to get something in the mail that a loved one touched and then sent home for the family to open. My girls are 11 and 13 years old and more tech savvy than my husband or I ever will be. Regardless, they still love getting something in the mail from me, especially since letters rarely come to them. Please keep it up for the folks in Afghanistan. I'm leaving Iraq hopefully forever, but I know how much those servicemembers appreciate them because I know how much those cards mean to me.